It's a new type of AIR-DRY modeling clay that requires no baking. The No Bake Clay® that dries with normal exposure to air after approximately 24 hours. It is water based and comes in 9 basic colors (Natural, White, Yellow, Red, Blue, Green, Brown, Black, Terra Cotta), 4 neon colors (Yellow, Orange, Pink, Green), and 1 glow in the dark. For additional colors you can mix the clay colors together or mix the clay with acrylic paints. Makin's Clay® is slightly acid when wet, it is acid free in dry stage. 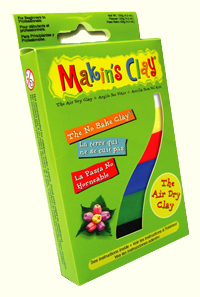 Makin's Clay® contains no PVC. It is certified non-toxic, and conforms to ACMI-AP safety and quality standards. It is safe to use for both adults and children above the age of 3. Can be shaped, rolled, stretched, or sculpted. Clay dries with normal exposure to air after approximately 24 hours (drying time may vary depending on thickness of clay). After clay has dried, it can be sanded and painted. Cover clay with wet towel when not in use. For a pliable and smooth finish, brush a small amount of water on clay surface. Create new colors by mixing acrylic paints with clay, or by mixing different clay colors together. Store clay in an airtight plastic bag. Roller & Cutters Set, Clay Tool Set and Clay Cutters of Makin's® Tool.